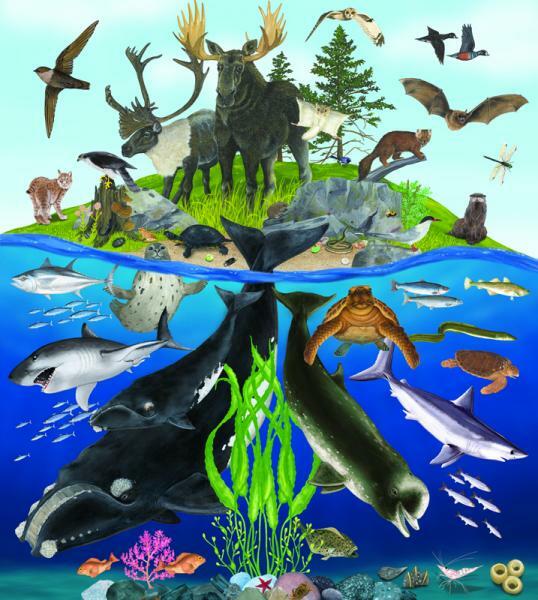 We love our environment and all the plants, bacteria, critters and animals which make up our beautiful diverse landscape that is Nova Scotia, so we decided to make a mural with artist Jeff Domm for our newly renovated office space with over 44 different species in tribute to our 44 years of EAC! The mural also helped us during our Next Level capital campaign, which allowed us to renovate our office space. With every $1,000 we raised for our EAC Next Level campaign, we flipped over one piece of this puzzle, to slowly reveal the beautiful mural underneath. With your help, we raised $301,564!! The puzzle is now complete. Come visit the mural in our newly renovated community space. Here are some details on the species in the mural! Habitat: They live in temperate waters, often near coastlines, and feed on tiny zooplankton in the water. 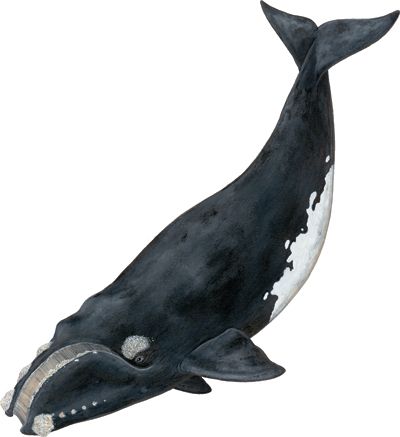 Fact: One possible reason the whales are named the “Right Whale” is because whalers considered it the “right” whale to hunt because of all the things that could be made from the whale and how relatively easy they were to catch. Challenges to species: These whales were a very important whaling species, and populations were decimated during the world’s whaling days. Being struck by boats is also a major problem for this population. What’s being done to help: Right Whales enjoy international protection from whaling activities. Recently, researchers from Dalhousie were part of a team that worked with the shipping industry to slightly move shipping lanes in an area that a lot of these boat strikes were occurring. This helped to greatly reduce the number of ship-related deaths of right whales. Habitat: Moose use lots of different types of forest habitat depending on what they are doing. If it is winter, they like coniferous forests because they are close to food and can avoid deep snow. They also like mature forests that provide shelter and possibly isolated areas to have calves. Fact: Male moose have antlers that they grow and shed every year. Antlers are shed in the winter, around January and grow back late spring. 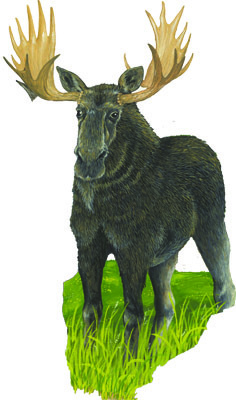 Female moose do not grow antlers. Challenge to Species: There is a brain disease that affects moose, as well as predation by bears and poaching by humans. Habitat destruction is also something moose have to contend with. What is being done to help: Hunting mainland moose is illegal and work is done to prosecute poachers. Also, the Province of Nova Scotia has an Action Plan for the moose to help in its recovery. One of the “action items” is public awareness and education about moose and how they can be helped. 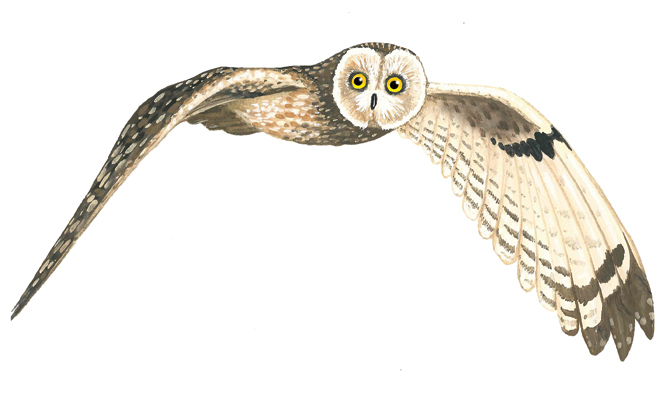 Habitat: The short-eared owl is often seen in open fields where it hunts its preferred prey, rodents, by flying close to the ground. Fact: Their Latin name, flammeus, translates to “the colour of fire”, in reference to their tawny brown plumage. Challenge to Species Short eared owls have suffered as a result of the loss and alteration of grasslands and marshes that they relied on as winter habitat, as well as heavy agricultural activity in other habitats. What is being done to help: The hunting, possession and sale of short-eared owls is prohibited in Canada. In the United States, harming of the birds, nests, and eggs is also prohibited. 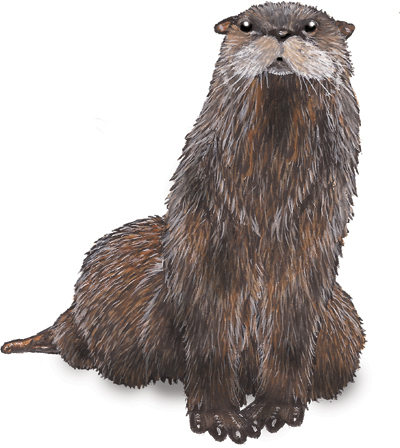 Habitat: Although the name suggests that river otters live exclusively in rivers, they live in a variety of aquatic habitats including rivers, lakes, estuaries and coastal marine areas. Fact: While river otters usually only live to be 8 or 9 in the wild, they can live into their 20s in captivity. Habitat: Great white sharks live in coastal and offshore waters at temperatures between 13 and 24 degrees Celsius. 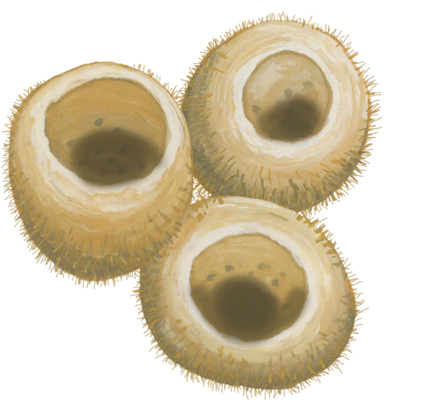 They are often found in regions where their preferred prey of seals, cetaceans, other sharks, and large fish are common. Fact: Great white sharks are an average of 13-17 feet long and weigh between 1500-2430 pounds, making them the largest predatory fish in the ocean. 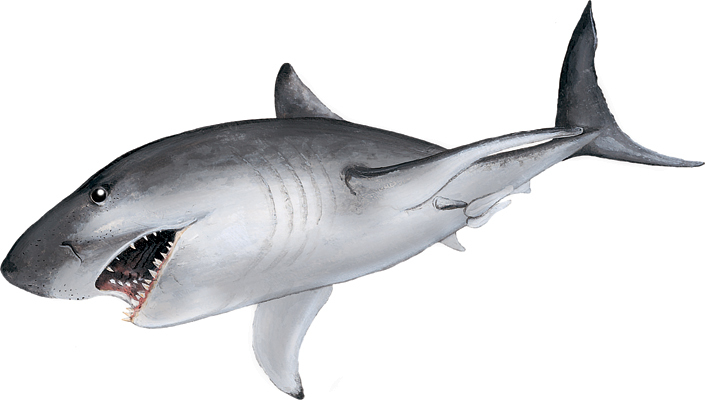 Like their relatives, the porbeagle shark, they are warm-bodied which allows them to swim in colder waters. Why are they in trouble? Sharks are easily overexploited because of their slow growth and low reproduction rates. Historically, populations of great white sharks have experienced significant declines due to interactions with fisheries, whether intentional or not. Habitat: Russian Hat Sponges are only found in three places in the world: Nova Scotia, the Gulf of Mexico, and the Azores. They attach themselves to the seafloor in deep water. The Gully is one place that they can be found. Fact: In the other two locations this species of sponge can be found, they grow in small groups or individually. Off the coast of Nova Scotia, they grow in huge numbers forming large sponge grounds. Fact: Sponge beds are important habitat for many fish species, and are being protected in Canada to help protect fish habitat. 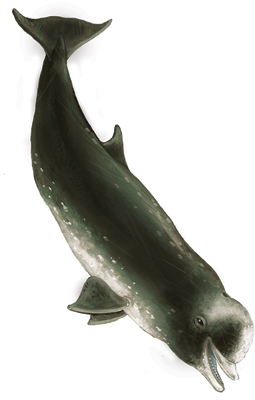 Habitat: The Northern Atlantic bottlenose whale inhabits deep waters of the Atlantic Ocean where it dives for its preferred prey of squid and fish. Fact: It is an extremely deep diver, and can reach depths of 1453 m.
Why is it in trouble? It was extensively hunted by Norwegian and British whalers until 1973. What is being done to help? Whaling has stopped, except in the Faroe Islands, where whaling is only permitted in the case of beached whales that cannot be rescued. Conservationists are now working to protect the whales from oil and gas development in its habitat. 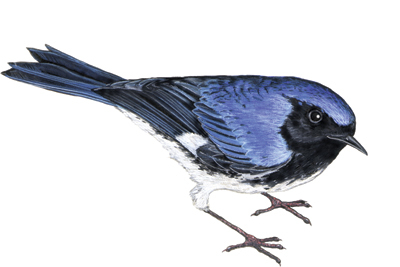 Habitat: These birds live in forests, but in the winter the males and females use slightly different habitats. Males are found in forests at lower elevations and females use srub-based forests at higher elevations. Fact: The males and females look so different that originally scientists thought they were two different species! Habitat: They prefer slow moving ponds or rivers and need shade. They are widespread and can be found in Boreal Forests. Fact: They eat mosquitoes! 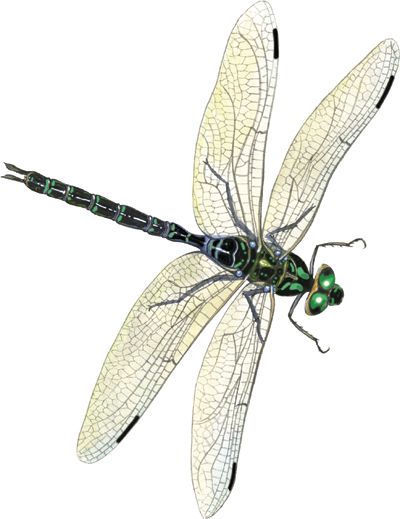 So if you see a Shadow Darner, or any other dragonfly, remember that it is a friend! They are quite acrobatic and can fly forwards, sideways and even backwards! Habitat: The Blandings Turtle is semi-aquatic and spends most of its time close to water, eating an omnivorous diet of fish, crustaceans, frogs, and vegetation. 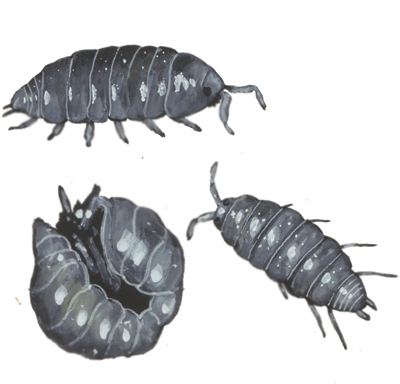 They hibernate over the winter under mud or debris. Fact: The Blanding’s Turtle can live to be up to 80 years old. Why is it in trouble? : Blandings Turtles are at risk because of habitat fragmentation and destruction by humans, as well as high rates of predation on nests by predators like foxes and raccoons. What is being done to help this species? Known Blandings Turtle habitats are now being protected. Habitat: The little brown bat is found across North America. During the spring and summer, it roosts during the daytime in buildings, caves, and under rocks and trees, and also roosts at night after feeding. During the winter, the little brown bat hibernates in caves and sometimes, unused mines. Fact: The little brown bat uses vocalizations for echolocation navigation and communication. When flying, little brown bats emit 20 echolocation calls per second. This increases to 200 calls per second while pursuing prey. Why is it in trouble? The little brown bat has suffered from the spread of White Nose Syndrome, a fungal infection which deteriorates skin on the muzzle, ears, and wings of bats. The disease also causes bats to awake from winter hibernation, which can cause unusual behaviour and depletion of fat reserves. What is being done? Several conservation efforts have promoted decontaminating clothing after leaving bat caves, as the disease can easily be transmitted between colonies. Habitat: Fast moving-waters in rocky terrain with lots of vegetation. This helps the ducks remain camouflaged from predators. They make use of rocky coastlines in the summer, where they feed on sea-life like fish and invertebrates. Facts: A ‘harlequin’ is someone who is a jester or a clown. Harlequin ducks got their name because their colour pattern looks like a clown costume! Harlequin ducks are are strong swimmers and have wide feet to help them swim in fast water. Why is it in trouble? : Because the duck populations often congregate in small areas, they aren’t spread around very much, they are really susceptible to catastrophes like oil spills. Habitat: This shark prefers waters below 14 degrees C, and is most often found in the waters on the continental shelf. It can dive to 370 m.
Fact: The porbeagle is one of the most cold-tolerant pelagic shark species. That’s because this species of shark is actually warm-bodied, keeping its temperature a few degrees above its environment so that it is better able to handle cold waters. It shares this characteristic with its close relative, the Great White Shark, with which the porbeagle is sometimes confused, despite its significantly smaller size. Why is it in trouble? 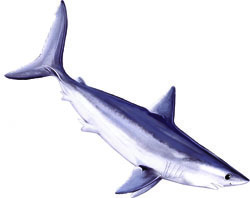 : The Porbeagle shark is a commercially fished species which has declined significantly due to fishing pressure. Until recently, it was being targeted directly by fishers and currently it is being caught as bycatch in several important fisheries. What is being done to help this species? Activities such as shark finning are prohibited in Canada and in 2013, the (albeit small) directed fishery for porbeagle was closed. While the porbeagle is on a path to recovery, estimates show that at the current rate, recovery could take around 100 years unless more is done to protect the species. EAC attends international meetings to advocate for a ban on the retention of porbeagle sharks throughout Atlantic large pelagic fisheries to allow for faster rebuilding. Habitat: As a highly-migratory fish, bluefin tuna will travel as far as the Gulf of Mexico or sometimes even the Mediterranean seas throughout the year, taking advantage of warmer waters for breeding and cooler waters for feeding. Fact: Tuna swim thousands of kilometers every year to move to each of the different habitats they make use of. Fact: Bluefin tuna are able to maintain the temperature of their inner muscles above that of the surrounding water to help them swim far and fast in cold waters. They also have a number of unique adaptations that makes their body as sleek and streamlined as possible. Why is it in trouble? : Atlantic bluefin tuna are a very important and valuable commercial species – just one tuna can sell for thousands of dollars, highly prized for its use in Japanese sushi. As a result, there has been a long history of overfishing many parts of the world, with the population that frequents the waters off Nova Scotia at only 55% of what it was in the 1970s. What is being done to help this species? The fishing of Atlantic bluefin tuna is regulated through an international management body, the International Commission for the Conservation of Atlantic Tuna (ICCAT). However, ICCAT is often criticized for its management policies of the tuna species under its jurisdiction. EAC has attended ICCAT for the past several years to advocate for precautionary management of bluefin tuna – while there have been some signs that the population is beginning to rebuild, the species must continue to be managed according to precautionary science so that it may make a full and timely recovery. 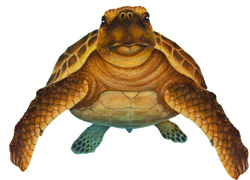 Habitat: The open ocean and near-shore is what brings the loggerheads near to Nova Scotia, they spawn further south where it is warmer but come up North to feed. Fact: They have really powerful jaws that help them eat their prey, which includes conch shells and other hard-shelled creatures. Fact: They make use of ocean currents to help them travel the large distances around the Atlantic Ocean. Why is it in trouble? : Populations all over the world are in trouble. The biggest problem is that individuals end up accidentally caught by fishing gear. The destruction of nesting areas or nests on beaches in the US breeding areas is also a big problem. What is being done to help this species? New fishing technology and changes in fishing gear have helped to reduce the number of turtles that are caught or allow the turtle a way to escape from fishing gear that they get caught in (like trawl nets). Habitat: Eels are bottom dwellers that burrow and become inactive during the winter. They will often migrate to brackish or coastal areas to feed during the spring, then either return to freshwater in the fall or migrate south to spawning grounds. Fact: Eels hatch in the Sargasso Sea and migrate as much as 6000 kilometers to feed and mature. They will return to the Sargasso Sea to spawn and complete their life cycle after 10-25 years. What is being done to help? Some of its habitat is protected, action plans have been implemented to reduce dam-related mortality and a binational American Eel Task Force has been created to assess how best to further protect. Habitat: Atlantic cod are found in temperate ocean climes in both shallow and deep sea areas. Fact: Atlantic cod can grow up to 2 meters in length and live for up to 25 years. Why is it in trouble? Atlantic cod has experienced significant population declines due to overfishing. What is being done to help? Atlantic cod is protected in Canada under both the Fisheries Act and the Ocean Act. Habitat: The Atlantic Salmon is an “anadromous” fish, meaning it is able to move from fresh water (juvenile) to saltwater (adult) and back again to reproduce, something that would kill most other fish. Juvenile salmon will go through various stages of their life in the freshwater habitats where they were deposited as eggs. They will stay remin in freshwater for 2 to 4 years, then they will migrate downsream and out into the open ocean where they will spend another 1 to 3 years feeding and growing before coming back as sexually mature adults to spawn in the rivers they were born in. Fact: After migrating as far out to sea as the coast of western Greenland and back, adult salmon will return to the same river and even the same few meters of riverbed they themselves were hatched from. Unlike the five varieties of Pacific salmon, the Atlantic salmon does not die after spawning and can return to spawn again several times over its lifespan. Fact: “Salmo Salar” is Latin for “salmon the leaper” due to the species habit of frequently jumping clear of the water and their ability to leap over waterfalls. Why is it in trouble? : The Atlantic salmon is a bellwether species for the health of the environment in both its freshwater and marine habitats. As such they face many threats including pollution, dams blocking fish passage on rivers, poor land use practices including clearcutting and agricultural run-off, mixed-stock fisheries on the high seas (Greenland and France), ocean warming and acidification and disease and parasite transfers from open net pen salmon farms. Atlantic salmon are also at risk from a newly developed GM salmon which has the potential to breed with wild salmon resulting in genetic contamination. What is being done to help this species? Not nearly enough. For many years the Department of Fisheries and Oceans (DFO) has cut its budgets for wild Atlantic salmon management and systematically eliminated its capacity to help protect and recover Atlantic salmon populations. It would appear DFO is content with simply documenting the species long, slow slide toward extinction than doing anything about it. Meanwhile volunteer organizations like the Atlantic Salmon Federation and local river associations have been doing their best to pick up the slack left by DFO – doing basic science and monitoring and massive amounts of freshwater habitat restoration work. EAC and other groups in Nova Scotia have fought hard to protect critical freshwater habitat and headwater spawning areas, reduce clearcutting and agricultural run-off into streams and brooks and oppose open net pen salmon farms from locating near wild salmon rivers. Jeff Domm is a wildlife illustrator/designer that has been published in over 30 books related to wildlife and the environment. Titles include Nova Scotia Birds, Nature Buide to Whalewatching, Nature Guide to the Seashore and many others. He has illustrated several books that his wife Kristin B. Domm has written, including Little Brother of the North, Ahmed and the Nest of Sand and Eagle of the Sea. His clients have included Environment Canada, Bedford Institute of Oceanography, Canadian Wildlife Services, Parks Canada, Resource Recovery Fund Board and many environmentally focused companies. Jeff has a BFA in Design/Illustration from Detroit Centre for Creative Studies and an MA in Film from Columbia College Chicago. He is also a filmmaker and has directed for Discovery Channel and many other documentary productions and kids programming. 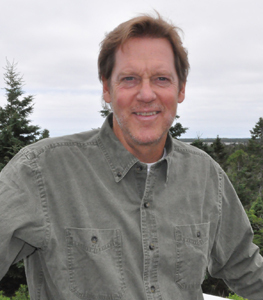 He works in his studio in Cow Bay and has been teaching Illustration and Design at NSCAD University since 1992. We thank Jeff for creating our beautiful mural! !